Pope Francis’ hidden adviser Pope Francis, is there a timeline for Curia reform? The highlight of the circumscribed press release about the meeting between Pope Francis and the U.S. president Barack Obama is that both parties affirm their mutual commitment to bring an end to the plague of the human trafficking. Human trafficking seems to be Pope Francis’ most important diplomatic challenge. Yes, there had been efforts and calls for world peace, culminating last September 7 in the day of Fasting and Prayer to stop a U.S. military intervention in Syria. And there had been Pope Francis’ continued appeals to dialogue, in the name of a «culture of the encounter,» a sentence Pope Francis often likes to insert in official press releases. Often, but not always. The «culture of the encounter» is not mentioned in the official press release issued at the end of President Obama’s visit. That visit, the way it had been managed, can help us uncover the path the Holy See diplomacy has taken under Pope Francis. United States has a considerable weight within the Vatican Walls. The major donors of Peter’s Pence are American. Some of the most generous patrons of the Vatican museum hail from the United States. The donations of the big U.S. Catholic organizations are reportedly used to even cover some of the (very high) Vatican bills for advisors and external consultants. At the same time, U.S. bishops have proved over the years to be among the best organized in the world. The struggles for religious freedom, against abortion, protecting conscientious objecting and traditional marriage have been examples of how bishops in the U.S. are among the few bishops anywhere who can still have an impact on public views in their countries. Generally, U.S. bishops are portrayed as traditionalist and entrenched on neo-conservative positions and the defense of life against abortion, to the detriment of social issues. This is only partially true, and it is an outcome of the polarization of public discourse in the United States. There is not a major political party taking «middle ground» positions, so issues are always considered from a political left or right perspective. Only a few remember the U.S. Conference of Catholic Bishops documents in the 1980s criticizing Reaganomics and calling for a stop to nuclear proliferation (this latter, followed by many other stances on the same issue). And few recall that, in more recent times, U.S. bishops have strongly advocated for immigration reform. Pope Francis’ emphasis on social issues has been mistaken as being in opposition to the positions of U.S. bishops. Francis has attracted the sympathy of the «American left». 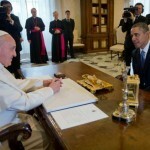 Obama likes him so much that he quoted the Apostolic exhortation «Evangelii Gaudium» in a speech. The preservers of values, who have so publicly committed to them, are so concerned by the broad support that has emerged for the Pope that now they feel displaced. To the latter, the Holy See press release on Obama’s visit was barely comforting. It makes reference to religious freedom, defense of life and objection of conscience among the topics discussed during the bilateral encounter, i.e. during the meeting between the U.S. delegation and the Vatican Secretariat of State officials led by Cardinal Pietro Parolin. That there were just two lukewarm lines dedicated to these topics is ultimately indicative of this agenda not being firmly supported. In fact, the Vatican Secretariat of State feels weakened, not knowing what its future will be following the Curia reform currently under discussion. Cardinal Parolin is too prudent to take a clear stand, and the U.S. bishops are not willing to appear as being out of touch with the “soft” agenda marked by Pope Francis’ lines of argumentation. The Pope believes it is not necessary to keep reiterating the doctrine of the Church at all times, as he explained in the press conference during the flight back from the World Youth Day in Rio de Janeiro last July. While Pope Francis may not want to fight head-on the big issues, there are others by which he is touched and moved. Like human trafficking. The issue of human trafficking is very linked to the discussion about the reform of U.S. immigration laws. This reform should also address the dramatic problems of the «indocumentados,» i.e. the people without proper documents who enter the U.S. from Mexico and who, if discovered, are deported back to their countries of origin, with no possibility to return. The «indocumentados» arrive from Mexico, but are not all Mexican. There are tens of thousands of South Americans who reach Mexico to try to get to the U.S., especially from Ecuador, El Salvador and Guatemala. Those who are not able to cross the border remain in Mexico, extorted by human trafficking cartels. It is widely believed that about 400,000 immigrants are “desaparecidos”: a humanitarian emergency that is not being acknowledged. More than the lengthy report issued by the U.S. Bishops, it was the warmth and frankness of Jersey Vargas that eventually moved the Pope to raise the situation of «indocumentados» during his meeting with Obama. Jersey Vargas, age 10, met Pope Francis at the end of the March 26 general audience. She was chosen as the spokesperson from a delegation of seventeen people representing various associations advocating on behalf of undocumented immigrants. She is the third of five siblings. She was born in the United States, so she is U.S. citizen. But her father entered the U.S. undocumented. At the time he is in a prison in Indiana, and could be deported to Mexico soon. This is how U.S. immigration laws break up families. According to a recent report issued by the U.S. bishops’ conference, among the “indocumentados” immigrants there are also 60,000 children. Other data reveal that the Obama administration deported about 31,000 people last year. Jersey Vargas asked the Pope to get involved in the plight of all the “indocumentados”, and certainly Pope Francis had done so during the 50 minutes of private meeting with President Obama, interjected by translation by their two interpreters. In fact, Pope Francis has often resort to prayer, more than high level meetings, as a diplomatic tool. But he had fierce words against human trafficking during his first year of pontificate. He spoke of human trafficking in a speech to a new group of ambassadors accredited to the Holy See last December 12. «It’s a disgrace» that people are treated «as objects, deceived, assaulted, often sold many times for different purposes and, in the end, killed or, in any case, physically and mentally harmed, ending up discarded and abandoned,» he said. The Pope told the ambassadors that human trafficking is «an issue that worries me very much and today is threatening people’s dignity.» Every country in the world is touched in some way by this new form of slavery, which often targets the most vulnerable members of society: women, children, the disabled, the poor and people from broken homes or other difficult situations, he said. Even those who have no religious beliefs should be concerned about victims of human trafficking out of pure «compassion for their suffering» and should help work to free them and heal their wounds, he added. Pope Francis, furthermore, acknowledged the many efforts underway around the world to prevent trafficking and protect victims. Even though countries have been addressing the problem, he said, «we can’t deny that sometimes even public officials and members of peacekeeping forces have been contaminated» by the corrupting forces of trafficking. (The account by a former peacekeeper denouncing her colleagues’ complicity in trafficking in Bosnia-Herzegovina in the late 1990s was the basis for the 2011 film The Whistleblower). Later, on March 18, Pope Francis and Archbishop Justin Welby signed an agreement by which the to Roman Catholic Church and the Anglican Communion will support an anti-slavery, anti-human trafficking initiative, the Global Freedom Network. Signed at Vatican City, the Global Freedom Network was also underwritten by a Sunni Muslim scholar on behalf of the Grand Imam of the prominent al-Azhar University in Cairo. Pope Francis also backed a workshop on «Trafficking in Human Beings: Modern Slavery,» organized by the Pontifical Academy for Sciences and held last November 2 and 3. Upon the close of the seminar, conference organizers issued a «joint statement based on the suggestions presented by the participants,» which included proposals for media, religious institutions, civil organizations and business sectors to work together in order to combat human trafficking. All of these initiatives prove that Pope Francis’ diplomatic effort is mostly focused on human trafficking. This is the core of Pope Francis’ diplomacy. 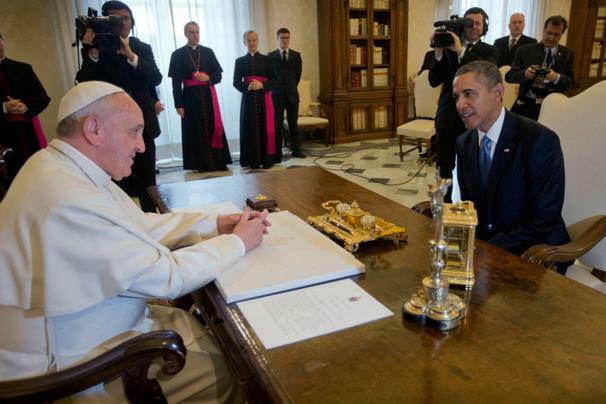 It is the only really important and urgent issue addressed by Pope Francis and President Obama. The rest was mostly a broad diplomatic conversation, based on a very general agenda.